No matter how big our creative dreams, we still have to live one day at a time. Or, to put it in reverse (and to quote Annie Dillard): “How we spend our days is, of course, how we spend our lives.” We can’t montage our way to success. We have to live every moment between now and then. And what we do with those moments is everything. We often ask filmmakers if they have a daily routine. They mostly say: “I wish.” Which leads us to two conclusions: (1) Great creative work is possible without a daily routine, and (2) Everyone knows that a lack of routine is not ideal. To help solve this problem (epidemic? 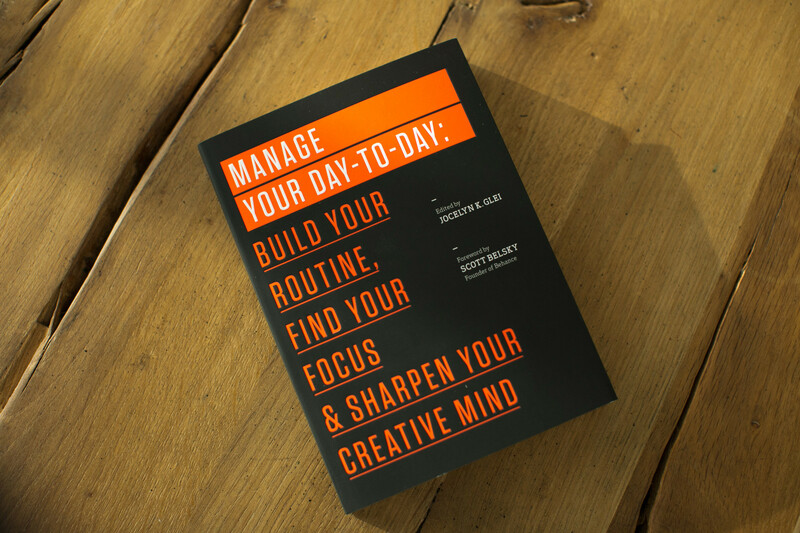 ), 99U put out a book for creatives called Manage Your Day-to-Day. It’s an unassuming title for a book that could change your life. The argument of the book is simple: When you take control of your day-to-day, you take control of your future. Here are 4 important lessons we learned from the book. Everyone has a time of day when they’re at their best. It becomes part of our identity. “I’m a morning person,” we say. Or “I’m a night owl.” It’s biology. Circadian rhythms. At some point in the day, everything lines up. That is the time of day you should be creating. Don’t waste those precious hours answering emails or sitting in meetings or taking care of things that could be handled easily by a lesser version of you. Our bodies are dumb. Easily tricked. Do we salivate for the cookie or the bell? As you establish your daily creative habit, combine it with repetitive stimuli. Work in the same place. Drink the same drink. Listen to the same music. You’ll find that things that once accompanied your creativity now trigger it. This might sound like a gimmick, but we’re dead serious. Use biology to your advantage. Once you’ve found your daily creative space, build a productive day around it. Block out dedicated time for other tasks like collaborating, emailing, cleaning, exercising, spending time with people. Give these tasks hard edges. Don’t let everything mix together into one big unproductive mush. Otherwise, you’ll look back over your year and realize you were always busy yet nothing ever got done. Taking time every day to be alone and clear your head will help you identify what actually needs your attention. A healthy daily routine isn’t just about what you put out, it’s also about what you put in. “Unlike computers,” the book says, “human beings aren’t meant to operate continuously, at high speeds, for long periods of time. Rather, we’re designed to move rhythmically between spending and renewing our energy.” There’s a handy test you can use to gauge if there is enough renewal in your life. Ask yourself: Am I miserable? If the answer is yes, there’s a good chance you’re all output and no input. You’re running on empty. You’re creatively hangry. Balance things out. It’s not complicated. Adding renewal to your routine looks like: getting enough sleep (don’t kid yourself, the vast majority of people need at least seven hours a night), getting enough exercise (the creative benefits of exercise are well documented), eating well and often, and taking time to enjoy what other people are making. You are what you eat. You get out what you put in. There is a long history of clichés that prove the importance of renewal is undeniable. “When I’m by myself, I can be myself,” Arcade Fire sings. And we might add: When we’re by ourselves, we can hear ourselves. It’s a loud, loud world out there. If you’re not careful, it can become a loud, loud world inside your own head. There are a million things vying for your headspace. Career responsibilities, looming deadlines, emails you don’t want to write, the future. Most people’s factory setting is to let the loudest thing win. But the loudest thing is rarely the most important — if it’s important at all. Taking time every day to be alone and clear your head will help you identify what actually needs your attention. The book explains: “This calming of the mind helps us to figure out what really matters and to hear [our] own creative voice, which can be drowned out by the cacophony of our daily tasks and online interactions.” So find a time and place to be alone every day. Sit quietly. Listen to your thoughts without responding to them. Focus on your breathing and your posture. Do this for 10 minutes. Guess what? You’re meditating. And a calm, clear mind is where great ideas are born. One of the benefits to all of this, beyond increasing your happiness and productivity, is that adding structure to your day-to-day can dramatically increase your ability to focus, to deeply focus, in a way that’s becoming very rare. Deep focus is where an understanding of a craft becomes a mastery, where a good idea becomes a great one. But it’s not a given. Just because you’ve set aside time doesn’t mean you will enter deep focus automatically. It’s an exercise and a practice — a feat of endurance. It’s something you build up over time. Start small. During one of your blocks of time, focus all your attention on the task at hand. Do not check Facebook. Do not check your email. Do not shoot off a text. Let your mind direct all of its energy toward one thing. “The key,” the book says, “is to never allow distraction. If you give in and quickly check Facebook, cancel the whole block and try again later.” It’s a brutal standard. But as the book explains: “Your mind can never come to believe that even a little bit of distraction is okay during these blocks.” Learning to focus deeply will take your mind, ideas, and creativity to places you never imagined they would go. It is, as best we can tell, the secret sauce. Thanks so much for everyone joining in the conversation in the comments! Congratulations to Cindy and Josh for each winning a copy of 99u's book.